We are instructed to seek offers in the reion of £1,785,000 (One Million Seven Hundres and Eighty Five Thousand pounds) for the frewhold interest subject to contract and exclusive of VAT for our client’s freehold interest. Priors Green Local Centre is situated at the heart of the residential expansion of Takeley that has occurred over the past 10 years. The property sits just off Bennet Canfield close to its junction with the B1256 Stortford Road in the centre of Takeley alongside Takeley Primary School and Community Centre. The Takeley residential expansion comprises a well established development of high quality housing by of approximately 815 new homes now completed with a substantial extension to the Priors Green area of new homes to the north east earmarked in the local plan for the coming few years. 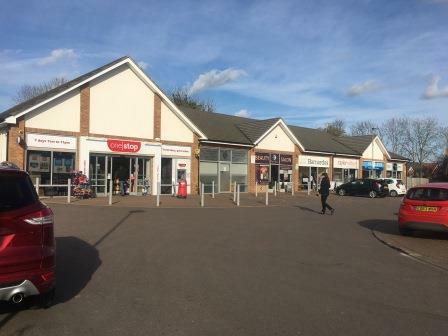 The property comprises of seven retail units totalling 7,975 sq ft (740.88 sq m). Unit 1 is let to One Stop Stores as anchor tenant and the other six units are let to a blend of national regional and local retailers. Completed in July 2013 Priors Green Local Centre is a new purpose built single storey local centre with 50 parking spaces. The property is let to a mixture of both national and local retail covenants as detailed in the above schedule of areas and tenancies. Priors Green local centre is subject to a service charge currently running at approximately £1.50 per sq ft.